CJWinter’s Cold Root Rolling division manufacturers Pin and Box cold roll wheels for both standard connections as well as proprietary connections. These cold roll wheels can last for several hundreds of connections, but the life that an end user will get out of the wheels depends on a variety of factors. In this blog, we will cover some of the major determinants that impact the overall lifespan of a cold roll wheel, and the measures that one can take to extend the life of the wheels. Correct RPM –The correct RPM is usually determined by the specification you should be following similar to the RPM mentioned in the DS-1. High RPMs are known to generate extreme heat which will compromise longevity of wheel life and will lead to premature wear on the cold roll wheel. Understanding Specifications - You need to know what specification you want to cold roll to, as this will affect the rest of your setup. The depth of the deformation you are looking to achieve will impact the pressures as well as the x-axis offset values. To determine your specification that you need to follow you should contact your customer and discuss their requirements prior to starting any cold rolling of connections. It is also important to note that the x-axis offset values will be based on either material or the yield strength of your connection, and will be different between pin and box connections. 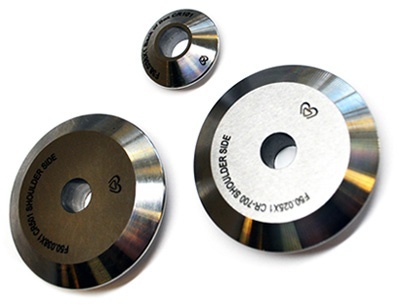 Pre-Loaded Pressure – Ensure that the pre-loaded pressure is set correctly on your cold roll tool. If the pre-loaded pressure is not set properly the roll holder runs the risk of bottoming out, causing excessive pressure and premature wheel wear to occur. Refer to the CJWinter Cold Rolling Instruction Manual if you will be following the DS-1 specification for recommended pressures. Hydraulic Pressure – Similar to pre-loaded pressure, the hydraulic pressure should also be evaluated during the cold rolling process. Note that the hydraulic pressure will differ between different size connections and types of materials that will be cold rolled. Excessive hydraulic pressure could cause premature wear to occur. To low of hydraulic pressure may contribute to not achieving the required depth of deformation desired. Alignment – Alignment within the setup is key when looking to preserve and extend cold roll wheel life. There are three types or alignment that need to be assessed. The first is the alignment of the wheel within the center of the thread pitch. This centering can be achieved in a variety of ways, but will depend on the type of lathe you are cold rolling on. (Some machines will have a “thread-teach” function, which will align the wheel automatically). If your Z axis tool offset is not set correctly, it will cause premature wear and the possibility of damage to the cold roll tool components. The second important alignment is the centering of the wheel in the root of the thread. If the wheel is not aligned to make contact with one of the flank angles, there is the possibility of premature wheel failure and component damage. If the wheel makes noise during the cold roll process, that is a sign that the wheel is misaligned within the root. (You can manually check of root alignment and mark the connection thread with dykem, wax, or putty to determine if the wheel is aligned.) The third alignment to be considered is the roll-holder alignment. The roll holder must be perpendicular to the thread axis, or wheel will undergo premature wear due to misaligned deformation. Pressurized Coolant – It is highly recommended that pressurized coolant be used on the surface finish of the thread root and wheel ID in order to reduce the wear on the wheel and wheel pin. The cooler you can keep the wheel while cold rolling, the longer wheel life will be achieved (as long as the alignment is correct). You may want to use a Synthetic oil or EP grease just before each rolling pass. Work Holding – Work holding is a critical part of the cold rolling process. If the part moves at all within the chuck, misalignment and premature wheel wear will occur. There is also the risk of causing component damage as well. Clean (Burr-Free) Setup - It is extremely important that the threaded connection is clean and free of any burrs, stringers, or loose material shavings. Debris on the threaded connection will be forced into the root of the connection by the cold roll wheel, causing damage to both the wheel and the connection, and ultimately rendering the cold roll wheel unfit for any other cold rolling passes. When do I change the wheel or roller? – Rolls need to be changed for different forms (i.e. when changing form a V-.038 form to a V-050 form), and when they show signs of wear. A quick and easy way to check is to run your fingernail around the tip radius. If your nail catches, the roll should be replaced.